The Wild Boar Tuff Grunt Elite passed through the ochre tones of Mudgee like a fantastical apparition. This time, it’s safe to judge a book by its cover. 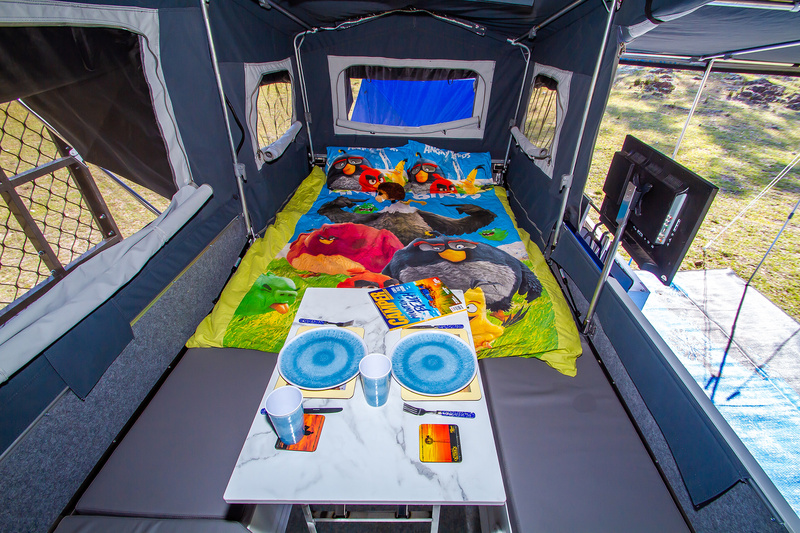 The judges found that this camper has the oomph to keep you out bush for extended stays, thanks to a mix of deft touches boosting both capacity and class. 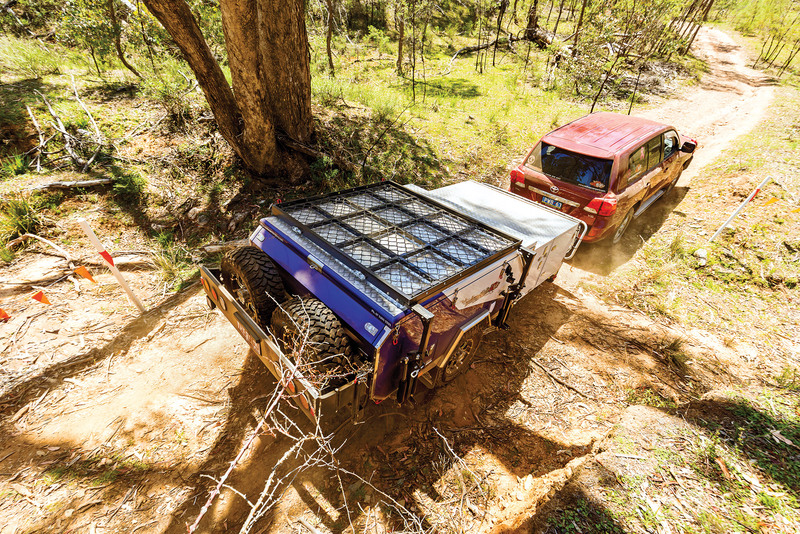 Wild Boar Campers produce a range of smart-looking and well set-up trailers, and the Tuff Grunt Elite is no exception. The high quality two-pack paint job on this camper really does hit you in the eyes as soon as it enters your visual field. Like many campers, this unit – or at least its chassis, body and canvas – comes out of China. 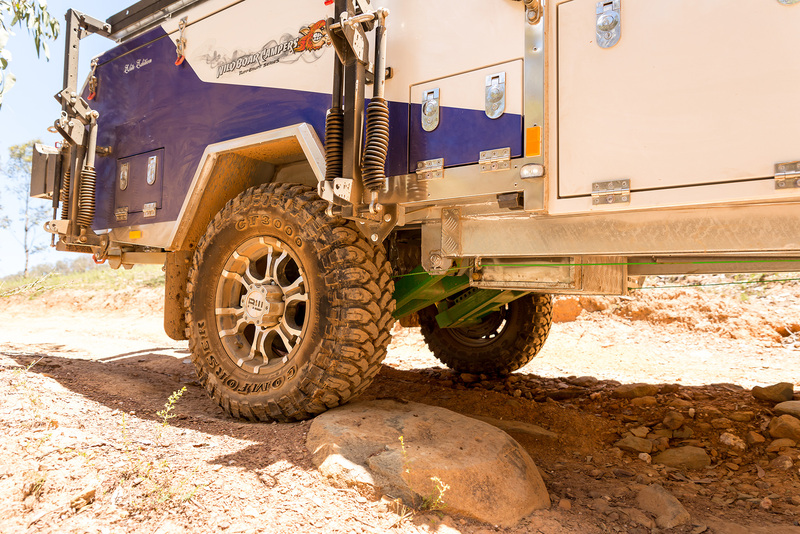 Unlike some of the horror stories you’ve heard about Chinese campers, the Tuff Grunt is well-built, with all welds on the chassis and suspension arms deeply etched and continuous with no dags visible. And while the canvas for the whole tent area comes out of China, it would have to be the best canvas material I’ve seen from that country. 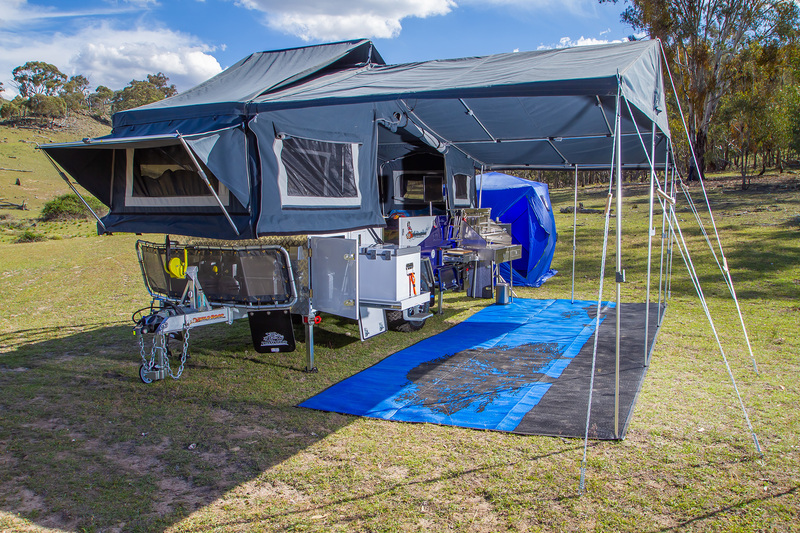 Backed up by great Aussie products such as Dobinsons shocks, a Cruisemaster DO35 tow coupling, a high quality Evakool fridge/freezer and Enerdrive battery management system, this unit not only looks great but is bound to deliver great camping experiences for years to come. In fact, this is one of the more impressive campers when it comes to living off the grid, with its three 100Ah AGM batteries, 160 watt solar panel, 150 litres of water in two tanks (plus two jerry cans), and two 4kg gas bottles. You are bound to notice the ease with which you can take the entry door completely off, which is great for getting it out of the way totally and preventing it from swinging in the wind. For me, too, the drop-down tyre carriers and swing-over boat rack are stellar touches. For 32 grand you get a lot of camper for your hard-earned dollars. And after all that, Wild Boar aren’t afraid to back their product with a good gutsy warranty of five years on the structural components such as the chassis and three years on the suspension; plus there’s a 12 month manufacturer warranty on individual items such as the cooker and battery management system. At $31,900, Wild Boar’s six-berth Tuff Grunt Elite is an impressive camper with a long list of inclusions, which snagged bonus points for value for money. It looks damn good, courtesy of the two-tone custom paint job and unique decal by Wild Boar’s Paul Burton. This is a camper that stands out from the crowd as it’s towed into camp. And let’s not forget you’ll be the talk of the campground once you start topping up everyone’s happy hour cocktails with ice cubes straight from the onboard ice maker! 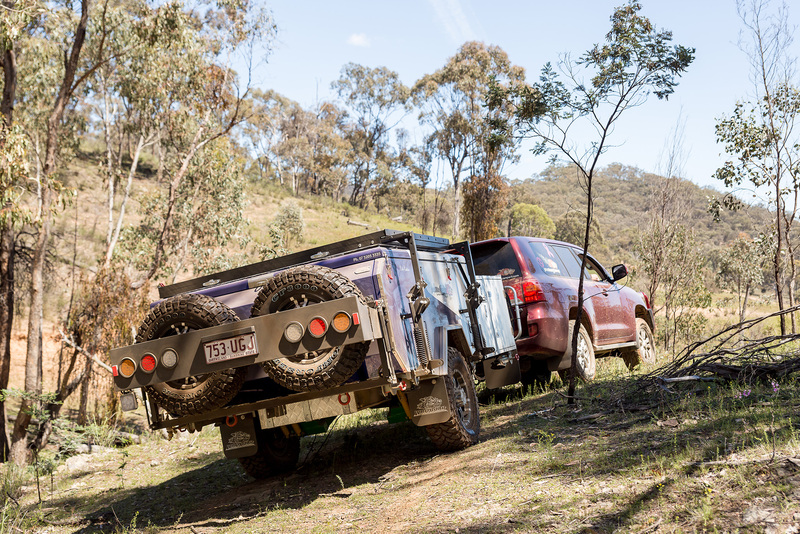 The camper tub, chassis and componentry are imported, with the fit and finish, including all the gas and electrical work, done by Wild Boar here in Australia. 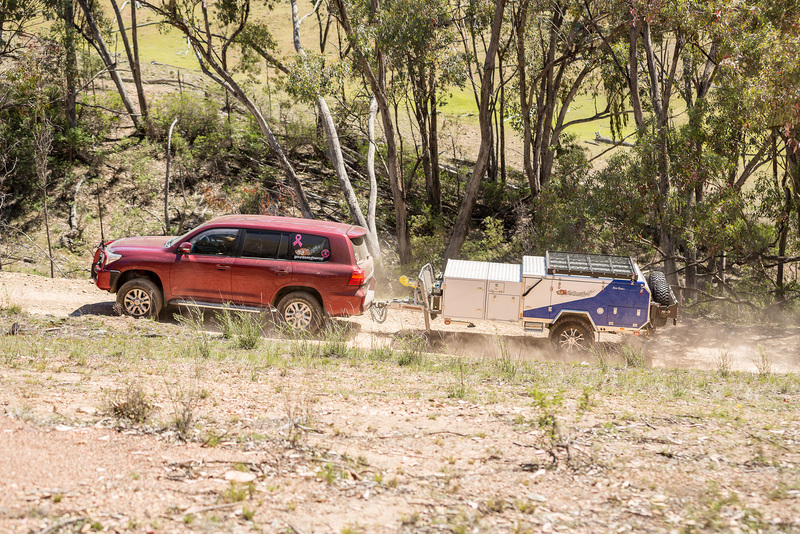 The end result is a quality unit that will follow your 4WD most places you’re going to want to take it. The camper body sits on a 120x50x4mm drawbar and 150x50x5mm hot dip galvanised one-piece chassis. 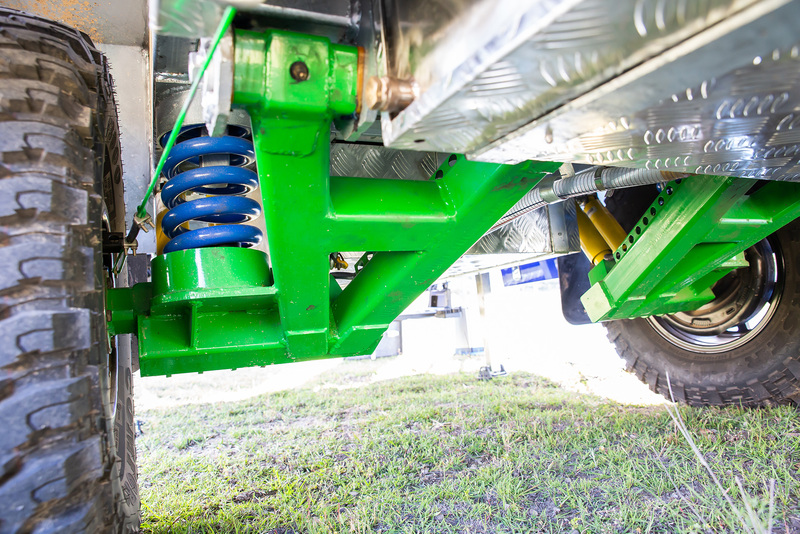 Trailing arm independent suspension and dual Dobinsons shocks are complemented by Wild Boar’s custom 25mm coil springs. Everything underneath is neat as a pin, with sealant over all the underbody fastenings to keep everything nicely protected. The Tuff Grunt Elite rides on 16x7 alloy rims with 265/75R16 mud terrain tyres and 12in electric brakes. Plus there’s two spares mounted at the rear for times of need. A Cruisemaster DO35 hitch up front completes the package. Good ground clearance and solid underpinnings are backed by a five year structural warranty, as well as a three year warranty on suspension. The paint job and finishings are excellent, with attention to detail extending to the custom alloy rolled edges of the camper box roof. The Tuff Grunt Elite comes in at 1590kg Tare with a 2300kg ATM and an appropriately rated (2.3T) breakaway brake system. 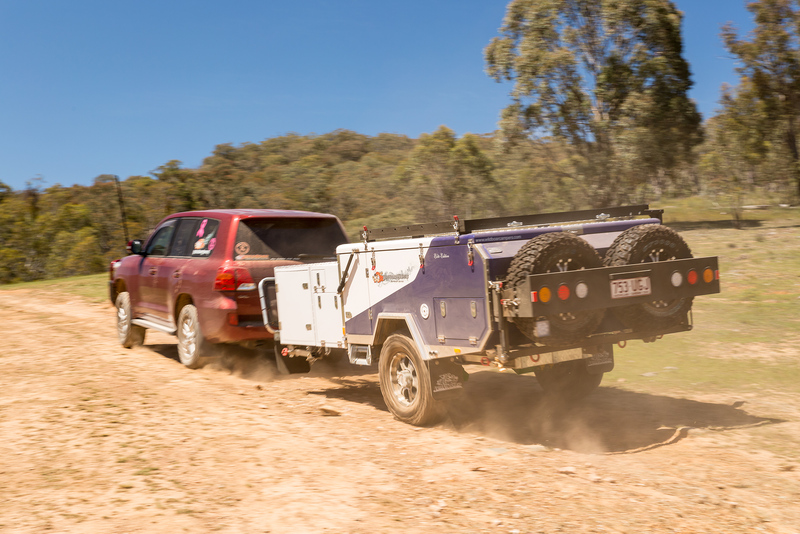 The 700kg load capacity gives families plenty of flexibility when packing. 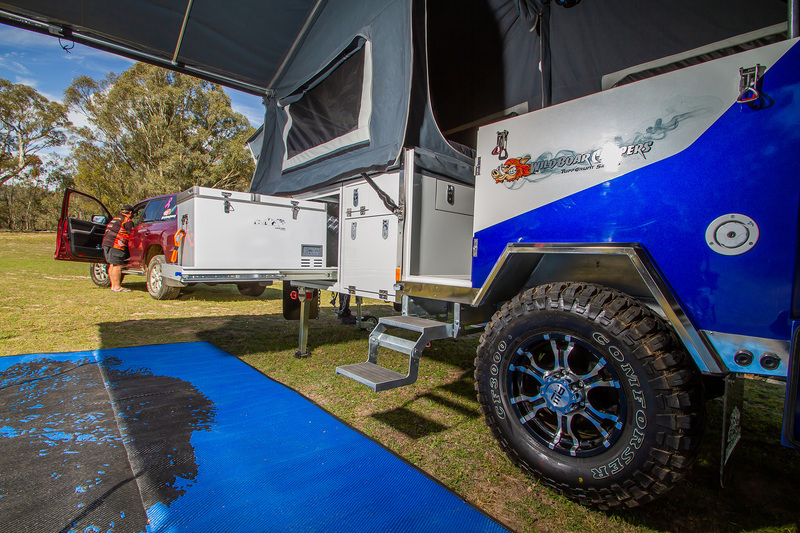 The camper trailer market isn’t a particularly easy one to stand out in, but Wild Boar are doing a great job at it – not only with their distinctive visuals, but more importantly with their clever design and attention to detail. The owner of Wild Boar, Paul Burton, comes from a background of both engineering and painting, which most definitely reflects in the product we witnessed in Mudgee. The not-so-soft belly of this particular piglet really caught my eye. The Elite setup consisted of a hot dip galvanised 100x50x5mm suspension frame and a 120x50x4mm drawbar, plus a sturdy independent suspension with Dobinsons shocks, held up high off the ground by 16x8 rims with chunky Comforser 265/75R16 mud terrain tyres. Add to this the quality with which this has all been put together, and that’s one pork belly I don’t want to get stuck into. I’d much rather it was towing behind me. The confidence to take this beast to such places is helped by the wisely closed-off plumbing and electrical circuits underneath, just as it is by the promising recovery angle (aided by the high-riding water tank); the reliable DO35 coupling at the front doesn’t hurt a bit, either. All the pieces of the puzzle combine to make a very enticing proposition. You know when a Wild Boar camper has driven into a campsite; its presentation jumps out at you. This has been the case with every camper they’ve entered into CTOTY over the years, and the 2019 REDARC competition was no different. The Tuff Grunt six-berth forward fold comes with a neat two-colour paint scheme and a killer graphic on the side, but can be matched to any automotive colour on the market to make your camper and tow package a real standout. 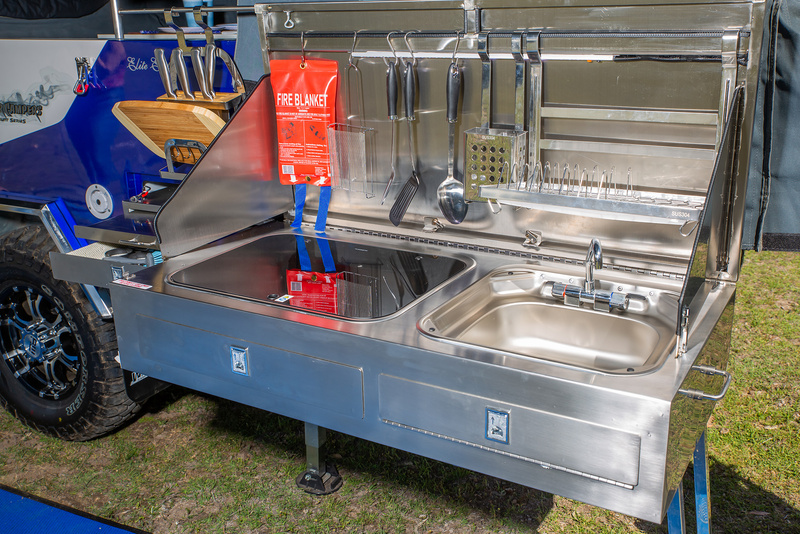 To lift this camper out of the ordinary for REDARC CTOTY 2019, there was a great swing-around stainless kitchen that simply works. Anyone cooking with it wouldn’t have their back to the rest of the crew. Add to that all manner of little features, such as a huge splashback, utensils hanging rack, towel rail, high wind guards, cutlery, fire blanket, choice of utensils (such as knife block and set, spice rack, and drainer), Smev three-burner cooker, and a cutlery drawer and slide-out bench extension at the kitchen hinge. The pantry is a large carpeted drawer with two sliding top drawers, and in front of that was an Evakool 75 litre fridge/freezer – but this can be expanded up to 110 litres. To keep yourself cool, there are dual head 12V fans fitted, but if you want the ultimate in comfort you can have under-seat air conditioning as an option (for which you’ll need a generator). Internally there’s an innerspring queen size mattress with a memory foam topper sewn in, plus a strip reading light above and wall pockets for your knick-knacks. With a body that’s 100mm wider than past Wild Boar models, the interior is roomier than some, and includes a swivel table and under-seat storage in the metal cabinetry. The table can convert to an east-west double bed and the back slides out for another double bed, making room for six.